I'm a "three-pointer". One of the reporters where I work, upon seeing Windy (left) emailed me and asked, "How did you do that?" And I replied, "Well, it took a good bit of time bent over with my rear end higher than my head, but you start off with two points -- the point of balance and the point you have three places where rocks A and B touch." 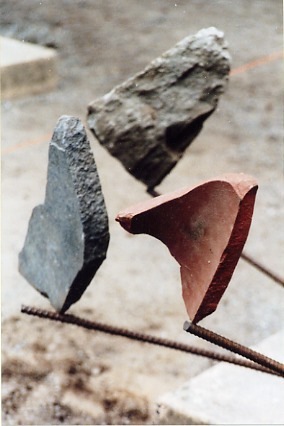 "Then you work to reconcile them, to find a single point -- if it exists -- where the rock is balanced and you have three contact points between rock A and rock B." Addendum: Don't get so excited about Project B that you trample Project A.